Editor's Note THINKING MACHINES HAVE LONG BEEN A TOPIC FOR THE FERTILE MINDS OF SCIENCE-FICTION WRITERS. BUT THEY'RE NO LONGER FICTION. T he theme of this issue is the consumerization of learning: the specifc impact that consumer- originated technologies can have on enterprise learning. Because how and where people work — and the new technology they use to get things done — are changing. As Salesforce University's Wayne McCulloch and CloudCoaching International's Walter Rogers wrote in a 2014 article: "If consumerization is to be efective, the systems that drive it have to aggressively target workforce engagement by delivering a great customer experience. Elements of consumer technologies — like social media, gamifcation and mobile — are integral. For learning professionals, the efects are hard to miss. From gamifcation and interactive learning experiences to the growing number of social media elements in performance and learning management, the technology employees expect to fnd in the workplace is evolving." Current technology — combined with the introduction of the "Big Data" concept not long ago — is on the cusp of producing what is being termed a "cognitive computer." In other words, a pile of nuts, bolts, silicon and diodes that can actually process raw information and then provide additional pertinent information to users in a cognitive way. Which brings us to the question posed in the headline. And if you read "Business of Learning" (beginning on page 15), you'll get the answer. A "compu-mentor" is an algorithmic computer program that can save to its memory any and every employee's workplace experiences, likes, favorites and preferences. Tis database can help make the compu-mentor "smarter" — and the compu-mentor returns the favor by fnding content that the employee needs or likes and directing the employee to relevant sources, resources and human mentors to help him or her solve daily challenges. "Learning is shifing toward non-traditional models," observes Ben Willis of Saba. Indeed. In this issue, we provide a raf of statistics that support his contention. Start with the "Business of Learning" article wthat includes stats from SNS Research. Ten check out the "Using Consumerization" article (beginning on page 18) to glean pertinent numbers about some of the computer algorithms being used in the consumer space and how they might apply to corporate and government learning. 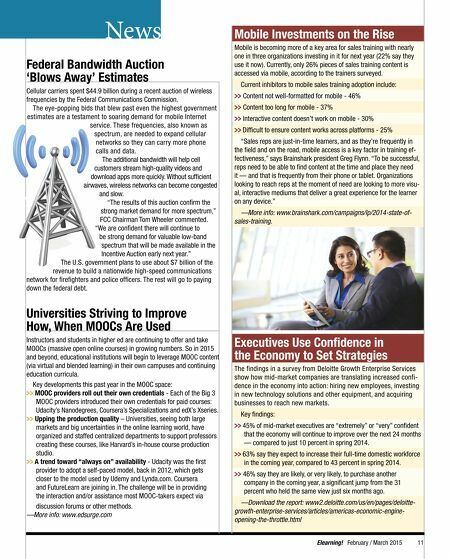 Finally, read the "Extended Enterprise Training" article (beginning on page 32) for the results of a signifcant, pertinent portion of Elearning! magazine's original annual research. Te act of researching and sourcing the information on learning consumerization that we present in this issue has been a real eye-opener — even for writers who try to keep up with the ever-changing impact of technology on life and work. We hope you feel the same when you've fnished reading. —Jerry Roche, editorial director 10 February / March 2015 Elearning! 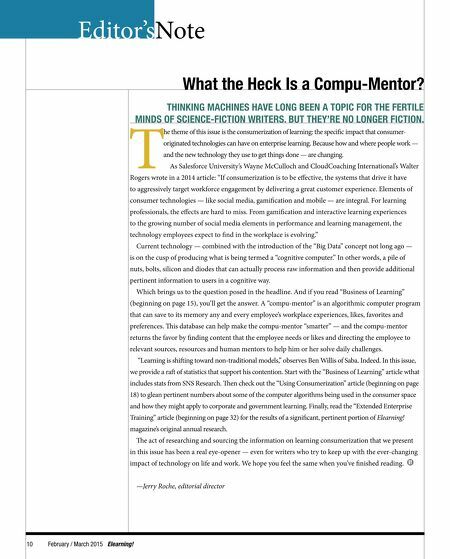 What the Heck Is a Compu-Mentor?